Photovoltaic solar cells deliver clean green energy and the technology has been well proven with over 2.5 GWp currently installed in the UK alone. However, photovoltaic uptake is still limited due to the high CAPEX outlay & slow Return on Investment (ROI). In order to accelerate widespread photovoltaic installation, there are strong drivers to further reduce the cost/W of solar cells. HI-PROSPECTS directly addresses this by developing innovative high resolution electrostatic ink jet technology to deposit fine copper electrode structures, for two distinct applications; front contact electrode structures for c-Si & fine line grid structured TCOs for ITO replacement. The technologies will increase cell efficiencies by reducing shading losses & will substitute expensive & volatile Ag pastes with cost effective nanoscale Cu. HI-PROSPECTS will demonstrate the technology on c-Si cells & on next generation perovskite solar cells with target efficiency of 17% at <£230 / kWp. The project will facilitate the additional manufacture of up to 5 GWp of PV by 2023, generating 4100 GWh of electrical power. PV OEMs face continued pressure to reduce the cost/W of solar cells. Additionally, they face significant price volatility & overall cost for Ag electrode structures. Second & third generation PV cell manufacturers also face high costs for ITO & high performance TCO coated glass. Therefore technologies that enable cell efficiency gains & that facilitate the replacement of expensive materials with cost effective alternatives generate strong business opportunities. The HI-PROSPECTS team will deliver a high resolution (< 3 microns) electrostatic ink jet (ESJET) technology capable of printing cost effective nano Cu front contact electrodes for c-Si cells & fine line Cu grid structures as a cost effective alternative to ITO. The project team will develop scaled up ESJET print heads in combination with nano Cu and nano nickel silicide ink formulations. In addition, the team will apply these technologies to the next generation of perovskite solar cells facilitating the development of perovskite single junction cells with an efficiency of up to 17% at a target cost < £230/ kWp. The project outputs will deliver a high resolution printing technology with cost effective ink formulations enabling new cell architectures with enhanced cell efficiencies with reduced conductive ink costs. Frost & Sullivan estimate the global PV market was worth £39.4 bn($59.8 bn or 28.5GW installed capacity) in 2013. Thin Film PV is ~14.1% of the current global PV market. The annual installed capacity is estimated to reach 54.2 GW by 2020 to £90.2 bn & is growing at CAGR of 9.6%. The market remains fragmented with >100 cell manufacturers, however, the top 10 manufacturers are 52.3% of the 2013 market -Yingli Green energy (market leader (10.7%), Trina Solar (8.1%) & Sharp Solar (5.9%). 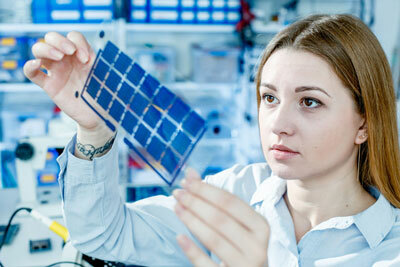 Si-based technologies lead the market with First Solar solely representing thin film technologies. Chinese manufacturing continues to dominate & all the top 10 companies have a manufacturing base in Asia. The flat glass market is worth~ £15 bn p.a. & is dominated by 4 large players (Asahi, NSG, Saint Gobain & Guardian) with > 60% market share. The solar glass market represents 1.2% of the total glass market & is more fragmented with a larger number of specialist manufacturers, with ASG and NSG as market leaders by volume. IDTechEx estimates by 2023, the global market for metal based conductive inks will be >$2bn growing with CAGR of 28.5%, with conductive nanoparticle inks for PV busbars ~ $621 mn, thin film busbars ~ $83 mn, & ITO replacement ~ $29 mn by 2018. The Silver paste sector is dominated by Dupont and Cabot and they are constantly improving their product offerings in an incremental manner. Nano-Ag based technologies are being commercialized in the form of metal particle based dispersion based inks or organo-metallic solutions. Their main advantage for PV application is the potential for thinner track widths & reduced track heights. Sintering can only be achieved after thermal curing procedure. However, nano-Ag inks are prohibitively expensive at £1646-3294 ($2,500-5,000/litre), which would increase the cost / W of a solar cell by over 15% compared with screen printed Ag flake (~£527 /kg or $800/kg). We have developed 3 strategies for developing market share, adressing the Silicon market, ITO replacement and opportunities within perovskite solar cells separately. We will introduce the ESJET technology to OEM Si cell manufacturers initially through R&D programmes through JM sales channels to secure an additional 6% global market share We will target OEM glass manufacturers (initially NSG) for sales of the ESJET hardware and for ink sales to manufacture fine line grid structure TCO glass. NSG will secure an additional 4% of the global market share for TCO coated glass for thin film PV equating to 544 MW. Thirdly, the consortium will work with OXPV to develop ESJET and fine line grid structure TCO glass for the next generation perovskite solar cells. Low cost alternative to ITO. HI-PROSPECTS technology will therefore be licenced to NSG for use within their global manufacturing base & fine line grid structure TCOs supplied to 2nd & 3rd generation solar cell manufacturers. PVI will generate licence revenues from the ESJET technology & will manufacture & sell the ESJET printing systems. IML will supply nanoscale Cu & nickel silicide ink formulations directly to NSG & to JM. OXPV will apply the technology to their existing perovskite single junction and tandem cells & will license both the perovskite tandem cell application to existing c-Si manufacurers and single junction Perovskite cell manufacture to OEM glass manufacturers including NSG. Beyond this, we will exploit in other PV applications & the ESJET technology will be exploited in automotive glass, OLEDs & printed electronics. Foreground IP generated from this work will be owned by the relevant partner(s) & all valuable IP will be protected where applicable using patents, copyright & trademarks prior to any public dissemination. over benefits exist for automotive glass & outside of the consortium for increased demand for PV installers & solar farms. Social: HI-PROSPECTS will help to secure existing high value jobs at JM and NSG both in R&D and manufacturing and will create up to 85 new jobs at PVI and 120 new positions at IML. In addition, further employment opportunities will be achieved for supply chain partners outside of the consortium. We will reduce fuel poverty to large sections of the community & will inherently improve the UK’s security of energy supply.